Almost a year ago, we asked â€œWill Android dominate the new in-car infotainment battleground?â€. Walking around the North American International Auto Show (NAIAS) last year, it was clear that cars would be the new battleground for operating systems. Microsoftâ€™s Windows Embedded Automotive was the choice of Ford, Kia, Fiat and Nissan, while General Motors were onboard with Research In Motionâ€™s QNX. We saw our first glimpse of Android in cars with the Roewe 350â€™s Continental AutoLinq system, and a year later it seems Android is gaining momentum. 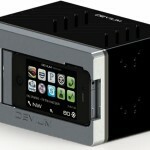 At CES 2012 a company called Rydeen showed off a close to be completed double-DIN stereo head unit running Froyo. 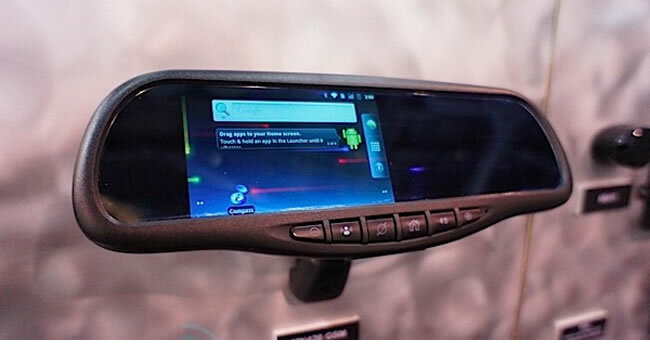 Slightly more progressive, Rydeen also demoed a rear-view mirror running Android. The company will most likely fork development of Android, as the stock experience doesnâ€™t really make sense in the context of a rear-view mirror. This could be ready by 2013, and itâ€™s exciting to see companies pushing the nascent idea of Android in cars. Androidâ€™s open architecture is the perfect fit for these kinds of progressive and bold ideas. Google sees the automotive industry as lucrative. Its experimentation with self-driving vehicles is a clear indication of that. Android can help Google stake a claim in the automotive business by providing an open architecture that flatters the progressive ideas of companies such as Rydeen. Androidâ€™s vast developer community ensures choice, and itâ€™s easy to envision mods of in-car systems being a compelling thought for tinkerers and car modification aficionados. In the article we wrote a year ago we argued that Android wasnâ€™t ready for mainstream adoption in cars. Until Google put out a tablet specific version of Android in Honeycomb for example, it was struggling to break into a market dominated by Apple. A car specific OS might make sense for infotainment head units, but what about Rydeenâ€™s progressive rear-view mirror? One could argue that Androidâ€™s open architecture is actually ready for prime-time in this context. In an industry where safety is paramount, Androidâ€™s community based plug-in culture may be overlooked in exchange for control, which would lead to a closed app eco system, but Android is far too compelling to be pushed aside outright.